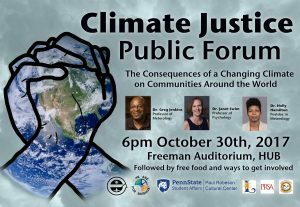 On Monday, October 30th from 6-8 pm in the Freeman Auditorium at the HUB, an esteemed group of speakers facilitated a panel discussion regarding the consequences of climate change on communities around the world. Panelists ranging from Dr. Holly Hamilton, a postdoc in Meteorology, to Dr. Janet Swim, professor of psychology, and Dr. Kimberley Thomas spoke on these wide ranging and ever present global issues. 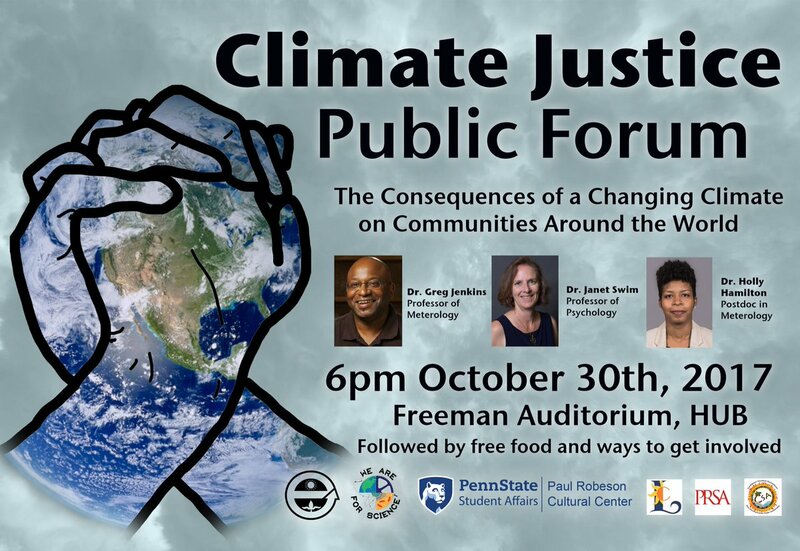 Hosted by EcoAction, We Are for Science, the Caribbean and Puerto Rico Student Association and the Paul Robeson Cultural Center, the public forum provided an open space to share concerns and connect with local organizations ranging from the Climate Reality Project, the Penn State Veg Club, PSU’s Black Student Union and the Puerto Rican Student Association, among others. The panel was directed by Dr. Jon Brockopp and questions ranged from specific project areas that the panelists were working on, to personal relationships with particular topics of concern. As the floor was opened up for questions, students shared their intimate experiences with climate change as it affected their local communities and environment. Topics ranging from the increase of hurricanes witnessed for the Caribbean islands, to the loss of biodiversity in the coral reefs within that region, to the adverse effects of meat consumption, to policy and climate change refugee concerns were addressed. Professionals working in the area of awareness and activism regarding environmental justice also spoke out on the issue. Leaders ranging from Peter Buckland of the Sustainability Institute, Carlos Wiley, director of the Paul Robeson Cultural Center, and Andrew Gutberlet from the Office of Physical Plant at Penn State, spoke about their experiences with climate change and steps they have taken to provide justice for the marginalized groups of people that are too often adversely affected. As the floor was opened for questions following the presenters notes, it was felt that climate change affects all of us; a student from the Black Student Council noted that he wished to share what he learned in the panel with members of his organization, to have this reach the people that really need to hear it. Often times, it is those that contribute the least that are ultimately affected the worst by the effects of climate change. Connecting where are faults are to where we can find common ground on these larger issues is essential for future success. 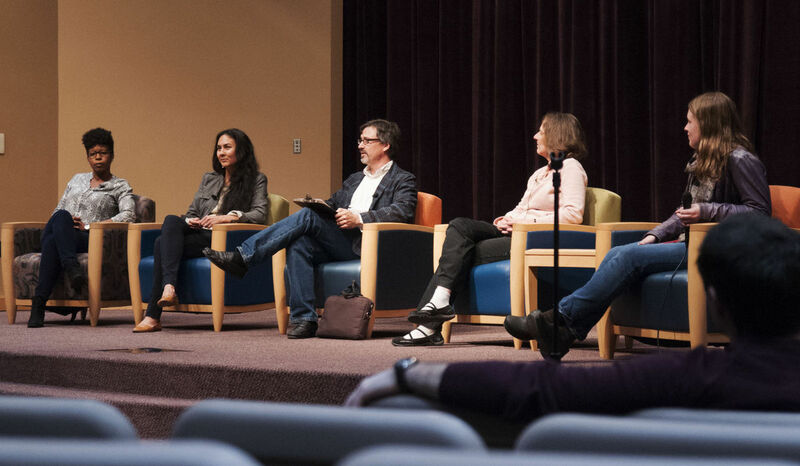 This panel proved to be the most comprehensive view of the stark reality to the foreboding adverse consequences of our changing climate that has been organized at Penn State thus far.